Eat. Live. Laugh. and sometimes shop! : Remembering the Brave. 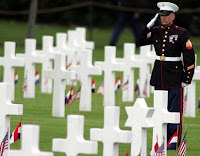 Honoring the brave men and women who served our country and died is the highest tribute we can give these courageous people this Memorial Day weekend. They helped get our country to the pinnacle of the modern world and have protected our democratic values. In times of freedom, we thank and remember those who made the ultimate sacrifice. For all of you who have had a family member serve and sacrifice, thank you. Our American justice system, based on democratic values, could not exist but for the sacrifices of so many men and women over the history of our country.